DEAUVILLE, France, May 28, 2011 (AFP) - The G8 world powers threw their weight behind the Arab Spring on Friday, intensifying the pressure on Libyan strongman Moamer Kadhafi and pledging billions for fledgling democracies. The West's drive to oust Kadhafi was boosted on both the military front -- with France and Britain vowing a "new phase" of operations -- and on the diplomatic, with Russia joining calls for him to step down and head into exile. "The world community does not see him as the Libyan leader," President Dmitry Medvedev said, in a turnaround in Russia's stance that was welcomed by summit host Nicolas Sarkozy of France and White House officials. 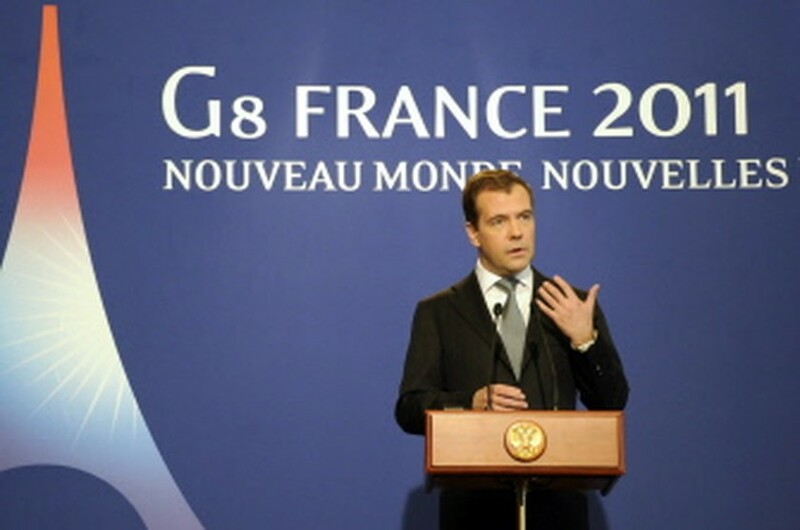 AFP - Russian President Dmitry Medvedev gestures while talking during a press conference at the end of the G8 summit in Deauville, on May 27, 2011. If Kadhafi were to go "this would be useful for... the Libyan people," Medvedev added. "Then one can discuss how it can be done, which country could take him and on what terms, what he could retain and what he must lose." The Libyan regime retorted that any initiative to resolve the crisis would have to go through the African Union. "The G8 is an economic summit. 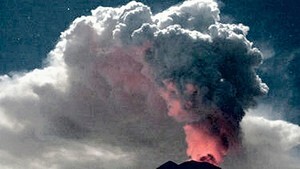 We are not concerned by its decisions," said Libya's deputy foreign minister Khaled Kaaim. Rejecting Russian mediation, he added: "We are an African country. Any initiative outside the AU framework will be rejected." African leaders at a summit in Addis Ababa on Thursday called for an end to NATO air strikes on Libya to pave the way for a political solution. Closing the two-day G8 meeting, Sarkozy was able to promise the Arab world $40 billion (28 billion euros) for development and democracy, from a range of international offers of aid and loans. "Democracy lays the best path to peace, stability, prosperity, shared growth and development," the leaders declared, after meeting with prime ministers from post-revolutionary Tunisia and Egypt seeking support for reform. Presidents and prime ministers of Britain, Canada, France, Germany, Italy, Japan, Russia and the United States had met in the French resort of Deauville. They took a tough line with the regimes resisting pro-democratic revolts, warning Libya and Syria to halt the violent repression of their own peoples. "We demand the immediate cessation of the use of force against civilians by the Libyan regime forces as well as the cessation of all incitement to hostility and violence against the civilian population," the statement said. "Kadhafi and the Libyan government have failed to fulfil their responsibility to protect the Libyan population and have lost all legitimacy. He has no future in a free, democratic Libya. He must go," it warned. Sarkozy said military action against Kadhafi would be stepped up and British Prime Minister David Cameron said the conflict was entering a new phase. He confirmed that Britain would send Apache helicopter gunships to target Libyan forces at close quarters. "There are signs that the momentum against Kadhafi is really building," he added. "The regime is on the back foot." US President Barack Obama said after talks with Sarkozy that "we have made progress on our Libya campaign" -- referring to NATO's air strikes. "We are joined in resolve to finish the job," he vowed. Ahead of the summit, Russia -- which has criticised the NATO air war on Kadhafi's regime -- was seen as reluctant to take a hard line, but it too toughened its stance on Libya during the Deauville meeting. Medvedev said later Russia would send its senior Africa envoy to the Libyan rebel bastion of Benghazi to contact the insurgents. The White House said Russia would share information on its dealings with Kadhafi and other Libyan officials. "We believe that Russia has a role to play going forward as a close partner of ours who also has discussions with the Libyan people," deputy US national security advisor Ben Rhodes told journalists. Medvedev also said Syria's President Bashar al-Assad should pass "from words to actions" in ending the deadly crackdown on protests against his regime. Russia nevertheless insisted on watering down an ultimatum to Syria, obliging its partners to drop a threat of United Nations Security Council sanctions in favour of a more general warning of "further measures". "We call on the Syrian leadership to immediately stop using force and intimidation against the Syrian people," the G8 said, even as troops loyal to Assad dispersed a new round of protests in Damascus.